A travel adapter has become an essential for using electronic devices when you travel. If the voltage or plug type differs from those within your country then you will need an adapter. Power outlets have different shapes in different parts of the world, so you will need an adapter to convert the shape of your home plug types to the shape of the outlets in the region of the world you're travelling to. There are many types of plugs used across the world. For example a European plug will typically be a Type C, whereas a US plug type will be a Type A. However in Asia you can find that there is a mix of plug types being used. The voltage of North America is 120 volts, with most electrical goods operating at around 110 volts. The plug type is two prongs with a third optional round pin. The voltage for UK and Ireland is 230 volts with most electrical goods operating at between 220 - 240 volts. 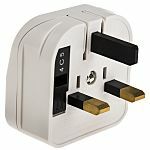 The United Kingdom and Ireland outlets require a unique 3 flat rectangular pronged plug type. Using the same voltage as the UK and Ireland of 230 volts with most electrical goods operating at between 220 - 240 volts. The difference though is Europe operates on a 2 round prong outlet. Argentina, Morocco, Thailand, China and Egypt also use the European 2 prong power outlet. These adapters offer a single adaptation from your electronic device, to you destinations electric output. So for example this could be a UK three prong plug to a European 2 Pin plug. These adapters offer multiple plug type options with multiple output options for travelling to different regions. So for example an adapter could have up too three types of plugs as the source and then have up to three types of plugs for the outlet. Is this travel adapter grounded or non-grounded? Yes, this travel adapter is grounded which means it is suitable for use with a three-prong type of electrical sockets. All devices will work normally without the ground wire because it's not a part of conducting path, however, grounding guarantees an extra security and protection for your appliances. No, this adapter is non-grounded which means it can be used with both two and three prong type sockets but do not secure device from electrical surges.